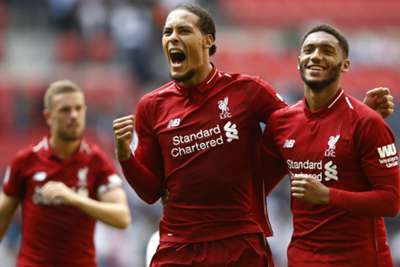 Virgil van Dijk insists Liverpool can challenge for Premier League and Champions League honours as they prepare for a decisive showdown with Napoli. The fate of Liverpool's Champions League campaign rests on the result of Tuesday's must-win Group C clash against Napoli at Anfield, with last season's runners-up facing the prospect of elimination. There have been suggestions a group-stage exit could be a blessing in disguise for Liverpool, allowing Jurgen Klopp's Premier League leaders to focus on domestic honours as the Reds eye their first league title since 1990. However, Liverpool centre-back Van Dijk dismissed the suggestion on the eve of the blockbuster fixture. "I don't think they are Liverpool fans [if they are saying that]," Van Dijk told reporters. "We want to compete on the highest level. As a club we have to stay on the highest level and do everything we can to go through. "I definitely look at the squad and think it can compete on two fronts. We still need to show it but I think we are definitely capable of competing in both competitions. Hopefully that will be the case." Liverpool are third in Group C, three points behind leaders Napoli and two adrift of Paris Saint-Germain following three defeats from five matches. "I don't know about putting it right but we want to show we belong in the Champions League," said van Dijk. "We want to show we are much better than what they saw over there. Napoli are among the most dangerous teams in Europe. "We have not been at our best in the Champions League so we deserve to be in the position where we are now. If we don't win, we don't deserve to be in the Champions League. "I hope that is not going to happen - that we are going to progress and show that we definitely belong."